Did you know Sha Wujing can be traced to an obscure Chinese desert spirit who was venerated as a minor Buddhist protector deity in Japan? This god is first mentioned in a 7th-century account of the historical Xuanzang, a.k.a. Tripitaka, titled Da Tang Daciensi Sanzang Fashi Zhuan (大唐大慈恩寺三藏法師傳, A Biography of the Tripitaka Master of the Great Ci’en Monastery of the Great Tang Dynasty). 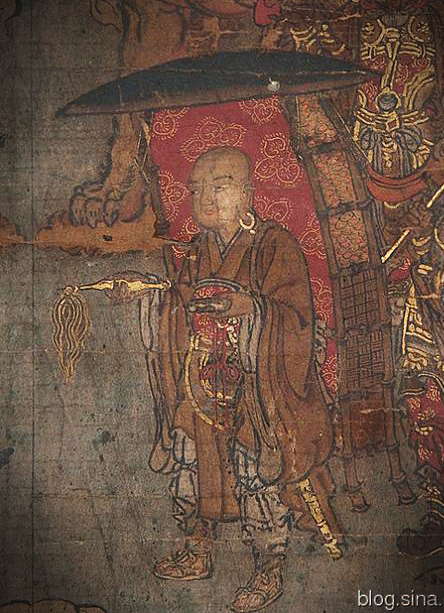 According to the text, Xuanzang spilled his surplus of water while in the deserts near Dunhuang, and after several days without drink, he had a fevered dream in which a tall, halberd-wielding spirit chastised him for sleeping instead of continuing his journey to retrieve scriptures from India. The monk immediately awoke and mounted his horse, which took him to an oasis with green grass and fresh water (Dudbridge, 1970, pp. 18-19). I am manifested in an aspect of fury. My head is like a crimson bowl. My two hands are like the nets of heaven and earth. From my neck hang the heads of seven demons. About my limbs are eight serpents, and two demon heads seem to engulf my (nether-) limbs…(Dudbridge, 1970, p. 20). Even though Xuanzang, of human origin, and Shensha shen, a demonic figure, were of low status in the Buddhist hierarchy, they are represented because of their role in the transmission of the Heart Sutra, and become elevated in rank by being shown with the deities and bodhisattvas that protect the sacred text (p. 63). Fig. 1 – 12th-century Japanese ink on paper painting (larger version); Fig. 2 – 13th to 14th-century Japanese Kamakura wooden statue (larger version); Fig. 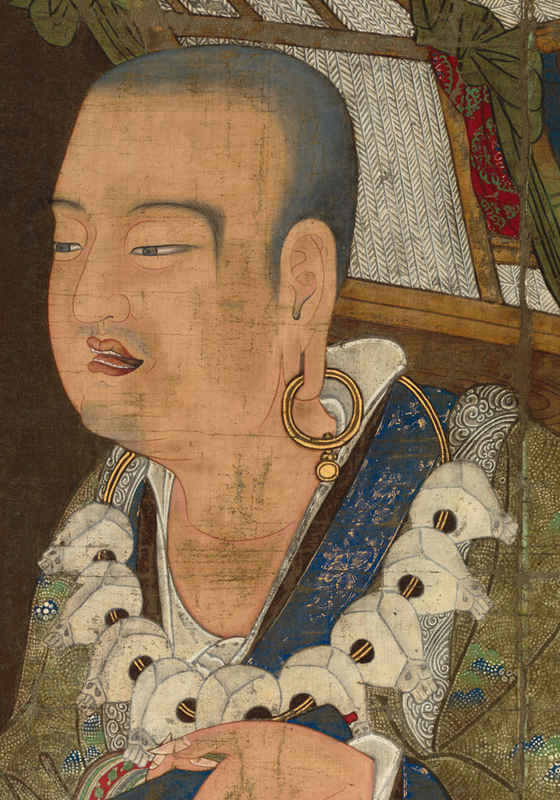 3 – Famous 14th-century Kamakura painting of Xuanzang (larger version); Fig. 4 – Detail of the skull necklace (larger version); Fig. 5 – Chinese Song Dynasty painting of the Buddha’s heavenly retinue, including Shensha shen (bottom center left) and Xuanzang (bottom center right) (larger version); Fig 6 – Detail of Shensha shen (larger version); Fig. 7 – Detail of Xuanzang (larger version). The concept of Shensha shen was well enough established in China by the 13th-century to be included in the eighth chapter of Master of the Law, Tripitaka of the Great Tang, Procures the Scriptures, the earliest version of Journey to the West. But instead of being a benevolent deity, he is portrayed as a bloodthirsty monster who had several times eaten Xuanzang’s past reincarnations. The demon tells him, “I am the one who devoured you twice before, monk. Slung from my neck are all your dry bones!” (Wivell, 1994, p. 1190). The monster only helps the monk and his retinue cross the “Deep Sands” via a magical golden bridge once he is threatened with heavily retribution. Memorial poems therefore note that Tripitaka releases the spirit from a five hundred-year-long curse, and Pilgrim (Sun Wukong) promises to speak highly of him when they finally meet the Buddha. 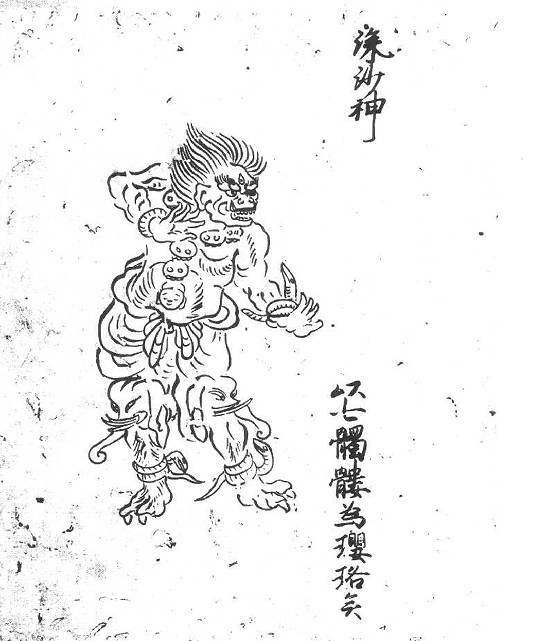 Sha Wujing first appears in the 22nd chapter of the final 1592 edition as an ogre-like beast living in the “Flowing Sands River” (Liusha he, 流沙河), a callback to the similarly named desert from earlier sources . An old dragon’s voice like thunderclap or drum. He wore a cape of light yellow goose down. Two strands of white reeds tied around his waist [fig. 8]. His hands held an awesome priestly staff (Wu & Yu, 2012, p. 422). Like Master of the Law, Sha Wujing is persuaded to help the group cross the river, but this time it is after Xuanzang takes him as his third and final disciple (he had previously been pacified and converted by the Bodhisattva Guanyin). The water spirit takes off his skull necklace and, with the aid of a heaven-sent magic gourd, transforms the accoutrements into a boat on which Tripitaka rides to the other side. Fig. 8 – A modern depiction of Sha Wujing by Tianwaitang on deviantart (larger version). He wields the vajra in the right hand and from his left shoulder hangs the Khatvanga [staff] with a flowing banner, like a sacred thread. He carries in his left hand the kapala [skull cap] full of blood. His necklace is beautified by a chain of half-a-hundred severed heads [Fig. 10]. His face is slightly distorted with bare fangs and blood-shot eyes. His brown hair rises upwards and forms into a crown which bears the effigy of Aksobhya [Buddha]. He wears a kundala [ear decoration] and is decked in ornaments of bones. His head is beautified by five skulls (Donaldson, 2001, p. 221). This attire is traceable to that worn by adherents of Heruka, another wrathful deity, as prescribed in the Indian Buddhist Hevajra Tantra (Ch: 大悲空智金剛大教王儀軌經, Dabei kongzhi jingang dajiao wang yigui jing, 8th-century): “The yogin must wear the sacred ear-rings, and the circlet on his head; on his wrists the bracelets, and the girdle round his waist, rings around his ankles, bangles round his arms; he wears the bone-necklace and for his dress a tiger-skin…” (Linrothe, 1999, p. 250). Compare this description with, for example, the Song Dynasty painting of Shensha shen (fig. 6). Many of the elements are present. Fig. 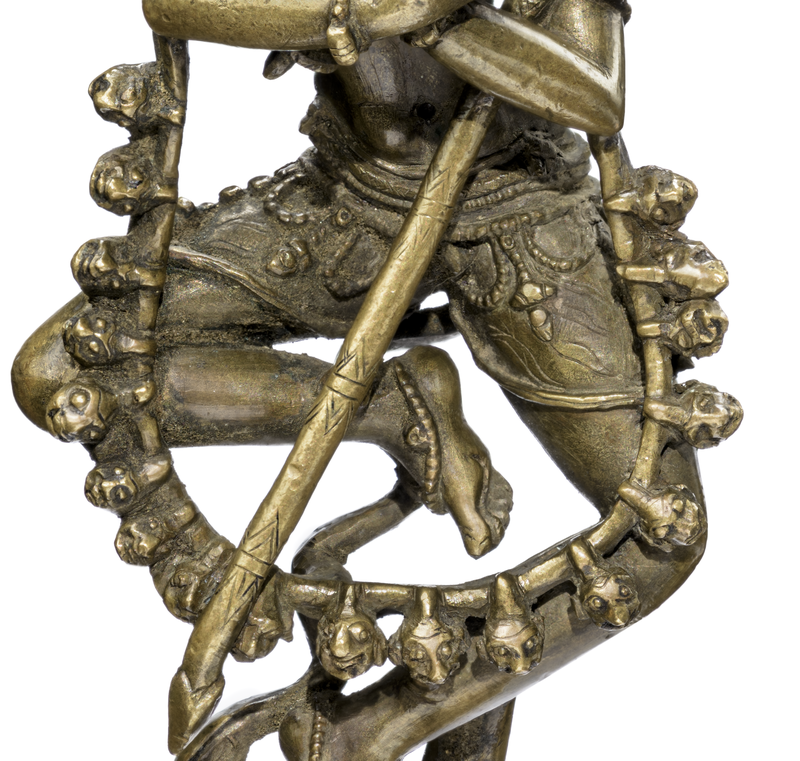 8 – The Buddhist Deity Hevajra, late 11th to early 12th-century, copper alloy (larger version). Courtesy of the Los Angeles County Museum of Art. Fig. 9 – Detail of the necklace (larger version). Sha Wujing is traceable to an obscure Chinese desert spirit first mentioned in an embellished 7th-century account of the historical Xuanzang’s travels. This and later accounts portray him as a benevolent guardian watching over the monk and providing Tripitaka with subsistence on his journey through the harsh “Flowing Sands” desert of northwestern China. The Japanese Monk Jōgyō wrote a 9th-century report in which he mentioned the deity and associated him with King Vaiśravaṇa. This appears to have led to his veneration in Japan, for sources from the 11th-century onward not only provide him with the titles Shensha shen (“Spirit of the Deep Sands”) and Jinja Taisho (“General of the Deep Sands”), but also lay out a prescribed iconography for him. 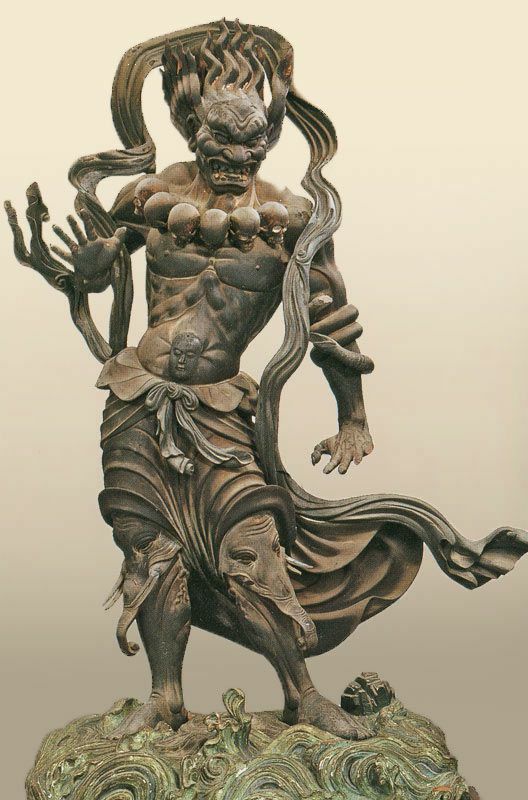 He is generally portrayed in late 12th to 14th-century Japanese art as a fierce warrior with flame-like hair, a necklace of skulls, serpent arm adornments, demonic knees, and (sometimes) bird-like talons. 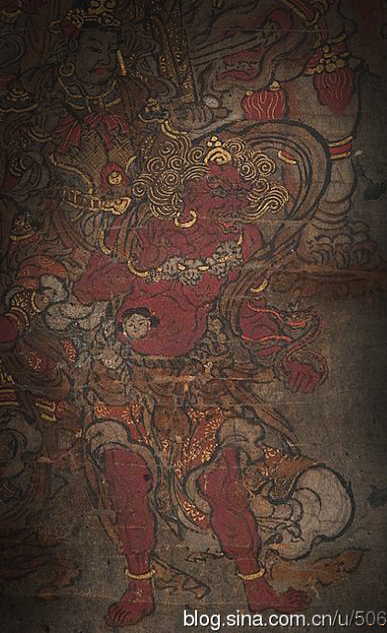 This spirit appears in Master of the Law, Tripitaka of the Great Tang, Procures the Scriptures (13th-century), the earliest version of Journey to the West, but is instead portrayed as a bloodthirsty desert demon who revels in having eaten Xuanzang’s last two incarnations. A necklace of dry bones serves as proof of his murderous hobby. He only decides to help the monk pass the Deep Sands when threatened with heavenly retribution. This episode served as the basis for Sha Wujing’s origin in the final 1592 version of the novel. He is similarly portrayed as a flesh-craving, skull necklace-wearing demon. Even his home, the aquatic realm of the “Deep Sands River”, is based on the former’s desert home. But after helping Tripitaka cross the river, Sha Wujing differentiates himself from his literary precursor by serving as the monk’s disciple and stalwart protector. The skull necklace can be traced to wrathful Esoteric Buddhist deities and their accoutrements. For example, an 11th-century esoteric text describes the deity Hevajra wearing a “necklace…beautified by a chain of half-a-hundred severed heads”. This is ultimately based on one of the five kinds of ritual adornments worn by Indian Buddhist yogin adherents of the wrathful deity Heruka during the 8th-century. 1) The original source says “Moving sands” (Dudbridge, 1970, p. 19 n. 3), but I have changed the wording to conform with that commonly used in various English translations of the tale. 2) Dudbridge, 1970, pp. 19-20. It’s interesting to note that King Vaiśravaṇa influenced another character from Journey to the West, Heavenly King Li Jing. Li Jing (李靖, 571-649) was a historical Tang dynasty general who won many battles in China and Central Asia. Shahar (2013) notes Li was deified after his death, and that the cult centered around him existed into the Song Dynasty. Most importantly, “The general [was] celebrated in a large body of oral and written fiction, which gradually associated him with the Indian god [Vaiśravana].” He continues, “Storytellers and playwrights [eventually] merged the Tang general with the martial Heavenly King” (28). This merging may have happened as early as the Yuan Dynasty (1271-1368) (Shahar & Kieschnick, 2013, p. 224 n. 18). 3) I unfortunately couldn’t find a high res version of this painting. All those I could find were either too blurry or to small for focusing on specific areas for details. The above linked webpage with the Song Dynasty variant includes a low res version of the Japanese painting. Wong, D. C. (2002). The making of a saint: Images of Xuanzang in East Asia. Early Medieval China 8, pp. 43-95.